Oniracom created a fun little campaign to promote Jack Johnson’s new music video “At Or With Me”. 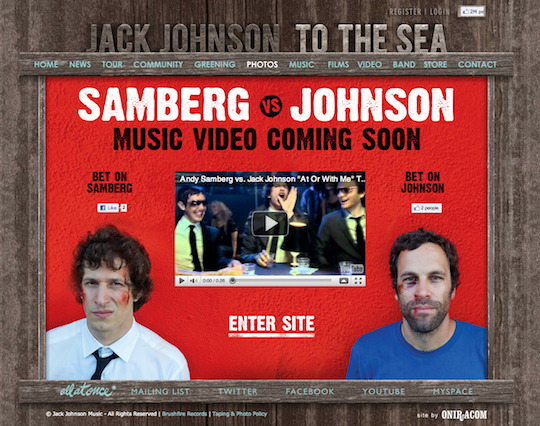 In the music video, Jack Johnson and Andy Samberg get into a minor slugfest. Oniracom created a splash page that featured a teaser for the music video and also the ability for fans to “place bets” on who they think will win. In order to place the bet, you simply click on the like button. The like appears in the Facebook news feed - creating BUZZ. Click Here to place your bet! This is only Phase 1 of the campaign. Stay tuned for Phase 2!